What makes a car green? An electric powertrain? An hybrid one? 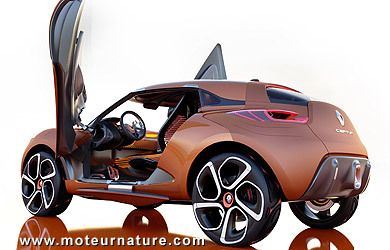 The Renault Captur concept doesn’t use any electric motor for its propulsion. It doesn’t even have a Stop & Start system to prevent it from idling when the car is stopped at the lights. 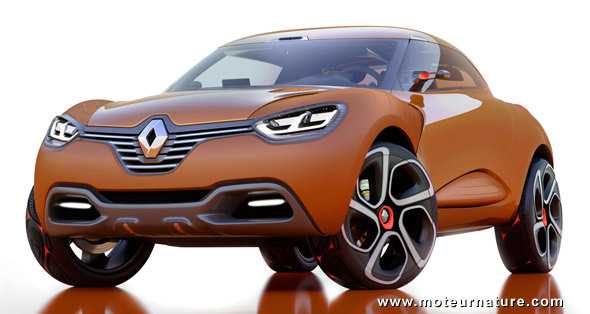 What the Captur has instead, is a diesel. 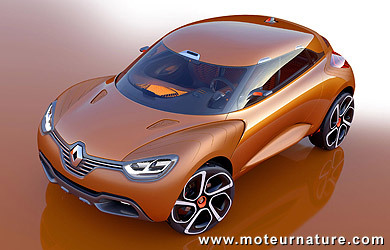 An excellent diesel, the next generation of Renault’s diesel engine which is about to be introduced on the Megane. It’s a small unit. 1.6-liter of displacement. The upcoming version in the Megane will make 130-hp, but it’s stronger in this Captur, making no less than 160-hp with 2-turbochargers. That’s 100-hp per liter, which is truly excellent for a diesel. But the torque value is even more impressive : 280-lbs/ft. 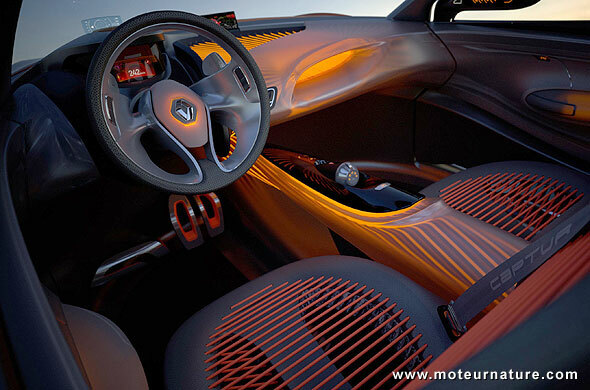 From a small 1.6-liter inline-four! That’s exactly the same value as the 3.7-litre V6 engine from a Ford Mustang. Of course, you can’t really compare, as the Ford engine makes much more power (305-hp), but the Captur gets much, much, better fuel economy. I don’t know how good actually, Renault hasn’t released any number for fuel consumption yet, only for CO2 emissions, with the hugely impressive value of 99-g/km. That is better than a Honda Insight which is at 101-g/km. Better fuel economy than an hybrid Honda, and better performances too, as the 0-to-62-mph exercise requires only 8-seconds, with a 130-mph top speed. This is the result of the combination of a very efficient diesel engine with an Efficient Dual Clutch (EDC) transmission. The other specs are average with a drag coefficient of .31 and a dry weight of 2866-lbs. 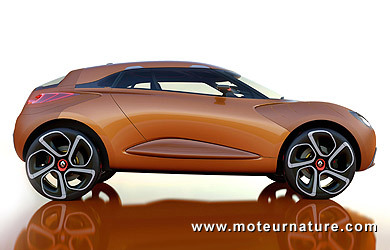 This Captur is a concept, but a production model should follow next year. It’ll be very different, with 4-doors and 4-seats, a bit narrower too, but it shall retain the spirit of this concept, and more important: its fuel economy. It’ll be Europe only.